The availability of a reproducible and clinically relevant scale for grading angiographic outcomes following acute stroke intervention would facilitate both research endeavors and clinical practice. For several decades, interventional cardiologists have used the Thrombolysis in Myocardial Infarction (TIMI) scale to describe angiographic findings following coronary revascularization procedures.1 In 2003, the Technology Assessment Committees of the American Society of Interventional and Therapeutic Neuroradiology and the Society of Interventional Radiology proposed a seemingly simple and direct modification of the TIMI scale to describe angiographic findings following acute stroke intervention, termed the Thrombolysis in Cerebral Infarction (TICI) scale.2 This scale and its many derivatives are widely referenced in the literature. Unfortunately, the TICI scale contains internal inconsistencies that render it and its derivatives impossible to apply in practice. Careful reading of the TICI definition begs the question, “How does one grade cases in which greater than two-thirds but less than ‘complete' filling of the territory is noted?” For example, a patient in whom 80% of the MCA territory is opened is not defined in the TICI scale because this is “better” than 2a but “worse” than 2b— that is, impossible to assign any TICI grade (Fig 1). This shortcoming alone renders the original TICI scale cumbersome, at best, to apply in either clinical or research settings. A, Lateral DSA following acute stroke intervention shows delay in flow in the posterior division of the MCA (arrows) compared with the anterior cerebral artery branches. B, Late arterial phase shows opacification of nearly all of the MCA. Because this represents more than two-thirds of the MCA (and thus not TICI 2a) but not “complete filling” (and thus not TICI 2b), it cannot be categorized by using the original TICI classifications. But, things get worse. On the basis of the original TICI definition, in category 2, either antegrade flow into or rate of clearance from the distal territory must be delayed. How, then, does one classify a case in which a portion of the MCA is opened and in which this revascularized bed demonstrates a normal rate of antegrade flow (Fig 2)? In TIMI, only grade 3 applies to normal rates of antegrade flow. In TICI, does a partially revascularized MCA territory with normal rate of distal opacification indicate grade 2, grade 3, or neither? As above, this (common) angiographic outcome, with partial revascularization demonstrating excellent antegrade flow, cannot be graded by using the original TICI definition. Lateral DSA following acute stroke intervention shows a normal rate of antegrade flow in most of the MCA territory, with only a small amount of nonperfused parenchyma (arrows). The branches with normal antegrade flow would go into the TICI 3 category, while those with absent antegrade flow would go in the TICI 0 category, but there is no single TICI category for this angiogram. Some reviewers might want to put it into TICI 2, but it would not fit for 2 reasons: First, there is no portion of the territory with slow perfusion; second, the perfused area is greater than two-thirds of the MCA territory (making it incompatible with TICI 2a) but less than 100% of the MCA territory (making it incompatible with TICI 2b). And, that is not all. Leptomeningeal collateral flow may have a profound impact on outcome, yet it remains unclear how the TICI scale accounts for such flow. 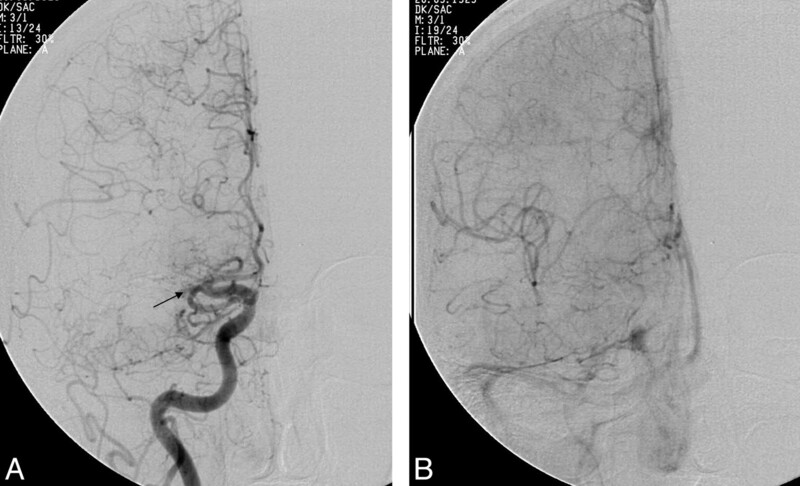 Is a case with a persistent M1 occlusion but robust anterior cerebral artery to MCA leptomeningeal collateral flow with full (but retrograde) MCA opacification graded as TICI 0 or is it a TICI 3 (Fig 3)? A, Anteroposterior DSA following acute stroke intervention shows persistent occlusion of the MCA. 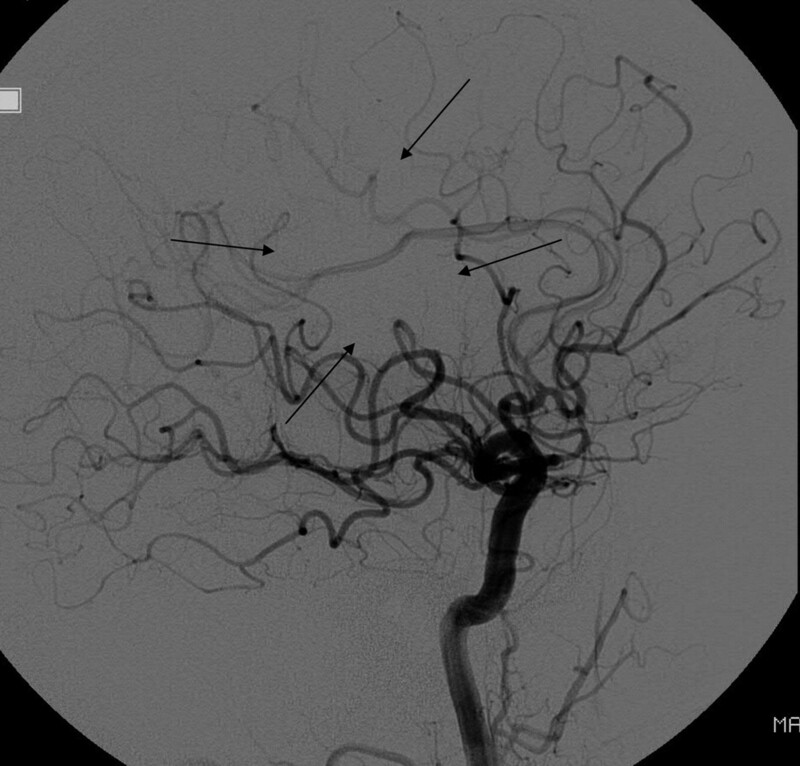 B, Late arterial phase DSA in the same patient as in A shows robust, retrograde, anterior cerebral artery−MCA leptomeningeal flow with opacification of most of the MCA territory. Does this even matter? Yes. As industry develops new and better devices for us, approval agencies likely will require objective, clinically relevant, and usable scales to assess device efficacy. Furthermore, communication among the research community and among clinicians is possible only if each party is speaking the same language. Can TICI be fixed? Possibly, but fixing TICI is not a trivial endeavor. First, it might need to be reconfigured to apply to all of the potential combinations of absent/slow/normal antegrade flow was well as fractions of the distal territory perfused. Second, interobserver variability would need to be assessed. Third, correlation with clinical outcome would be needed. Finally, accounting for collateral flow would be ideal. As noted above, other scales in addition to TICI have been proposed for grading angiographic outcomes following stroke intervention. Some have added a “2c” subcategory,5 some use 50% rather than two-thirds as the cutoff between 2a and 2b,6 and some have inclusion of collateral flow in the outcomes.7 I remain agnostic as to what scale is ultimately applied, as long as such a scale is sensible, easily implemented, reproducible, and clinically relevant. Hopefully those researchers planning to use the TICI scale or its derivatives will recognize its inherent inconsistencies and either fix them or move on.